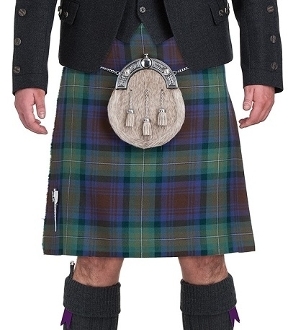 16 oz., 8 yard tartan kilts are crafted from authentic worsted wool. Our kilt makers will custom tailor each kilt to your specifications. The kilt pleats may be sewn to sett or to line (stripe). Each of our kilts comes with three buckles and leather straps, double fringe on front apron. Kilts are lined at the waist. The measurements we need are waist at navel, hips, and drop from navel to knee. This kilt is one of the finest, heavy weight, hand-sewn kilts made. Lead time on these custom made kilts are approximately 6 to 8 weeks. Buy with confidence! We will work with you with any sizing questions!